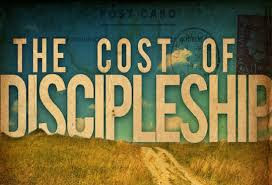 This Sunday's scripture readings ask us to consider the cost of discipleship. In our first reading (Wisdom 9:13-18), we begin with a reading about the unfathomable wisdom of God. It helps set the tone for our Gospel reading. This is the supreme God whom Jesus tells us must be before all else. "Who can know God's counsel, or who can conceive what the LORD intends? For the deliberations of mortals are timid, and unsure are our plans. For the corruptible body burdens the soul and the earthen shelter weighs down the mind that has many concerns. And scarce do we guess the things on earth, and what is within our grasp we find with difficulty; but when things are in heaven, who can search them out? Or who ever knew your counsel, except you had given wisdom and sent your holy spirit from on high? And thus were the paths of those on earth made straight." In our Gospel reading (Luke 14:25-33), Jesus cautioned the crowds following him to consider the cost of discipleship before following him. It is not for the weak hearted. The cost -- complete detachment - from every thing and every one. "Great crowds were traveling with Jesus, and he turned and addressed them, 'If anyone comes to me without hating his father and mother, wife and children, brothers and sisters, and even his own life, he cannot be my disciple. Whoever does not carry his own cross and come after me cannot be my disciple. Which of you wishing to construct a tower does not first sit down and calculate the cost to see if there is enough for its completion? Otherwise, after laying the foundation and finding himself unable to finish the work the onlookers should laugh at him and say, 'This one began to build but did not have the resources to finish.' Or what king marching into battle would not first sit down and decide whether with ten thousand troops he can successfully oppose another king advancing upon him with twenty thousand troops? But if not, while he is still far away, he will send a delegation to ask for peace terms. In the same way, anyone of you who does not renounce all his possessions cannot be my disciple.'" In our Epistle reading from the Letter to Philemon (9-10, 12-17), St. Paul gives us an example of the cost of discipleship we heard about in the Gospel. First, he is writing from prison, and secondly, he sends the former slave, Onesimus, to Philemon in Colossae. Onesimus is now "more tha a slave, a brother." "I, Paul, an old man, and now also a prisoner for Christ Jesus, urge you on behalf of my child Onesimus, whose father I have become in my imprisonment; I am sending him, that is, my own heart, back to you. I should have liked to retain him for myself, so that he might serve me on your behalf in my imprisonment for the gospel, but I did not want to do anything without your consent, so that the good you do might not be forced but voluntary. Perhaps this is why he was away from you for a while, that you might have him back forever, no longer as a slave but more than a slave, a brother, beloved especially to me, but even more so to you, as a man and in the Lord. So if you regard me as a partner, welcome him as you would me." What Jesus may really be saying is, whatever you love, detach yourself and love me more. Whomever you love, detach yourself and love me more. But as we see in our first reading, "thus will the paths of those on earth made straight."